Question: Is Roatan a dangerous place to live? Answer: Everywhere is dangerous. I’m not being overly vague, I’m just being honest. I have lived in Roatan for over two years now and have never had a problem. I can say with absolute honesty that I looked over my shoulder far more often walking around Washington, DC, than I do around here. I have bars on my windows and doors here, just like I did in Washington, DC. I have also accidentally left my keys in the ignition of my scooter here and found them still sitting in there hours later. I don’t walk around by myself at 3am waving all my cash, just like I wouldn’t do anywhere else. Having lived in wildly different settings around the world, I can say I feel safe living in Roatan. Question: What types of crimes do happen in Roatan? Answer: Most crimes are theft. Anywhere in the world where you have wealth next to extreme poverty, you will also see theft. It’s a fact of life. That is one reason why there were bars on my windows and doors in DC as well – the dichotomy between rich and poor is enormous in that city just like it is on this island. I know people who have been mugged in Roatan, and people who have been mugged in DC. I know people who have come home to see their house has been robbed of all electronics and dive gear, which are big money-makers around here. It happens. Personally, I say do what you can to secure your belongings: purchase a safe, rent an apartment with good security, know the area you’re living in and know your neighbors. But at the end of the day if people want to steal from you, they’ll steal from you. Period. But that situation isn’t unique to Roatan. For the record, my parents were robbed three times living in three different middle-class suburban towns of Massachusetts. I was pick-pocketed in Barcelona, Spain. Theft happens everywhere. Question: Isn’t Honduras the murder capital of the world? Answer: Yes, Honduras has the highest rate of murders per capita of any country in the world at 103.9 per 100,000. Yes, that is a disgusting honor to have. Yes, the cost of life here is cheap. But – again – living in Roatan I do not feel unsafe; I do not fear that I could be killed any day. The majority of issues we hear about revolve around drugs and gangs. I have also traveled through mainland Honduras and did not feel that I was in any danger. I have friends who have lived on the mainland for years, happily and safely. Honduras struggles with drug trafficking and gang violence that has reached an incredible height. Luckily, the effects of those struggles are minimally noticed in Roatan. The complexity of the issues Honduras faces cannot be understated, so I will certainly not delve into it here. But what I will reiterate is that while this country has problems, I do not feel unsafe living in Roatan. 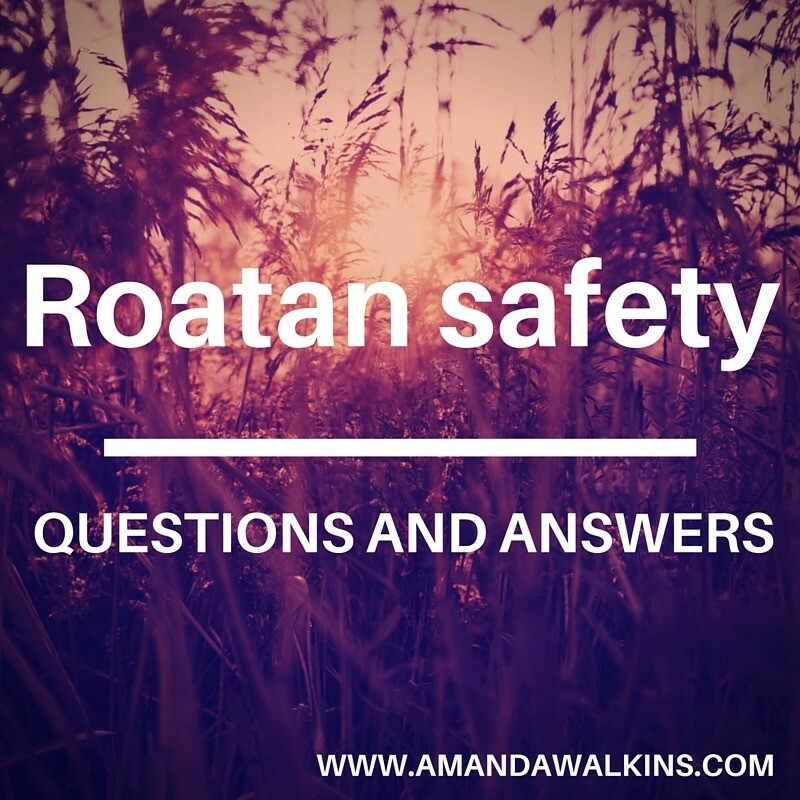 Question: Will my kids be safe growing up in Roatan? Answer: Refer to Kirsty’s story about raising her awesome daughter, Spencer Rose, here in Roatan. Not having kids, I can only offer my outside perspective. But here’s what I will say: I love seeing kids run around and explore and learn about life first-hand here rather than the stifled experiences I see many kids having in the U.S. now. Kids can be dirty and break bones and cry, and they’ll bounce back to be even stronger. We see that every day here from both local and expat kids. They all play together and learn from each other and they experience life as it’s meant to be experienced as a child: carefree and full of awe. They do not feel unsafe in Roatan. And the parents whose kids are running into the surf and chatting with people in open-air beach bars? They don’t feel their kids are in danger, either. They know the kids are being watched over by the entire community, giving them the opportunity and space to grow. I know I cannot possibly answer all questions related to safety in Roatan simply because each person’s perspective is unique. But what I can offer is a personal viewpoint from someone who is not at all invested in this island (I own no property, I do not run a business, and I am not reliant upon Roatan’s success for all my income). I often see complaints from both sides of the coin: expats hate seeing negative stories about Honduras – especially Roatan – in the news. Outsiders think that the reality is much worse and issues are being brushed under the rug. I agree with neither side. Roatan, and all of Honduras, has problems. It is not perfect. I have yet to find any place on Earth to be perfect. But Roatan is pretty damn close to pure paradise, so that’s good enough in my book.